Located in the In the bedroom, before entering in the bathroom there is a small room with a small washing machine, drawers, shelves and hanging space for clothes and door window leading to balcony with table and 2 chairs, the bathroom itself has a large shower, bidet and window. 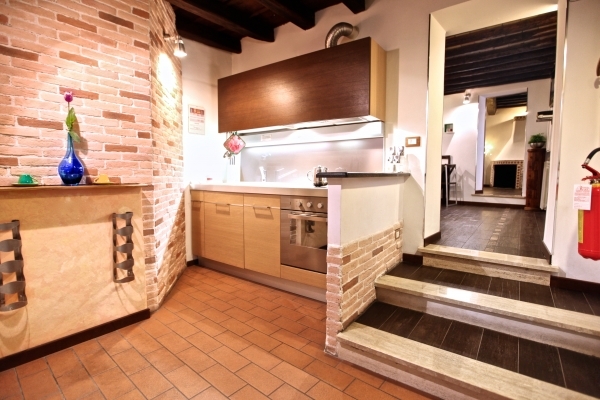 Independent heating, no phone, elevator, wm, dw, tv, dvd player, air conditioning, WiFi, balcony, 2 bikes for client's use.You can buy bottles of good italian wine from the owners on request.Monthly possible. PLEASE NOTE : This apartment is comfortable for 2 adults and 1 child/ adult or 2 adults and 2 small children. Not recommended for 4 adults. € 3,50 per person per night for City Taxes. Appartement idéalement situé et au calme, parfaitement adapté pour un couple, voire un couple avec un enfant. Chambre confortable et agréable. This is the second time we (me and my husband) stay in this apartment and we like it very much. It is very convenient, well-equipped and well-maintained. And we love its location! The host is very friendly and helpful. Hope that we will be back. The apartment was very clean and was very well maintained during our stay. Our host provided a very detailed introduction to the apartment and to the attractions in the area. We walked everywhere - the location was excellent. Our host also provided some translation assistance and made phone calls for us. I would not hesitate to recommend it or to stay here again. I love this apartment! Perfect location, quiet, exactly as shown on the site, easy check in and out.I will defintely stay here again on my next few trips to Rome. Apartment is very convenient and its location is great - we reached all places we wanted by foot. A nice surprise: plenty of travel guides in English! Pietro, the owner, was very nice and cooperative, provided detailed explanations and valuable recommendations. Will be happy to stay there again! great neighborhood and apartment was charming and comfortable. Just what we needed! Host was so nice and approachable and made sure everything went smoothly!! We are a couple who value privacy and we were happy to discover that this apartment is very private even though it is located in the city centre. It is very close to Campo de Fiori which is one of Rome's attractions, a square famous for its wonderful market. The apartment offers all the necessary facilities as well as a relaxing and, for us, romantic atmosphere. You'll find that the apartment is near most Roman attractions as well as some great cafes, restaurants and a fantastic wine bar "L'Angolo Divino' (The Antica Enoteca L'Angolo Divino wine bar is in the eighteenth century Palazzetto Giangiacomo, Via dei Balestrari n°12). Great location in Rome....great apartment......great owner.......perfect place with perfect suggestions from Pietro....we loved the building, the area and everything about it. Would recommend to anyone.....thank you so much for everything! We loved this apartment. There were three of us: my mother, myself and my 11-year-old son and we fit perfectly. The apartment beds were both really comfortable and the bathroom a good size. The elevator was a bonus for my mum and for ease of bringing luggage up. But the best part of the apartment is the fabulous location. A stone's throw from Campo de' Fiori but in a really quiet location. You can walk to the Pantheon, the Piazza Navona, easy access to bus services to the Vatican, Termini and not a particularly long walk to the Foro Romano even. All of us really enjoyed the apartment and would highly recommend it to others. This apartment is an excellent place to stay! We lived there for a week, our first visit to Rome. We would definitely stay there again. Pietro is an oustanding landlord, very attentive to our needs. He is a modern communicator, meaning that he replies to emails quickly and with thorough information, which was so helpful. The apartment is well-designed, tastefully appointed and VERY clean: nice layout, comfortable furniture, an efficient kitchen and wonderful bathroom. There is also a clothes washer. It was so nice to come home this well-maintained apartment after a full day of Rome's complexity. The location is terrific, especially for first time visitors to Rome. The street is very active with pedestrians, but you do not hear it at all in this apartment. The balcony is purely functional - for laundry or smokers (not our concern). But you don't need a view when you just spent all day in the city. Go back to the apartment to relax, enjoy watching a DVD or using the internet. The apartment has excellent WIFI (which is essential in my opinion).